So you've decided it's time to replace your old beater with a newer car... or maybe it was decided for you when something crashed into it. Whatever the reason, you're looking for a good used car, because you aren't about to absorb the depreciation that comes standard with every new car. But before you drop dime one on that newer set of wheels, drive it over to your local Cottman center for a complete pre-purchase inspection. That's because even the latest model used car can be hiding some serious defects... defects that can cost you a bundle later on. The technicians at your nearby Cottman know this, and they know what to look for to make sure the car you buy isn't harboring any unfortunate surprises. What kind of surprises? Well, first they'll look for signs of damage, such as an accident that didn't show up on your online searches (yes, that can happen). Next, they'll look for any major system issues, such as engine or transmission problems. And they'll see whether those systems have been cared for properly or have been ignored. 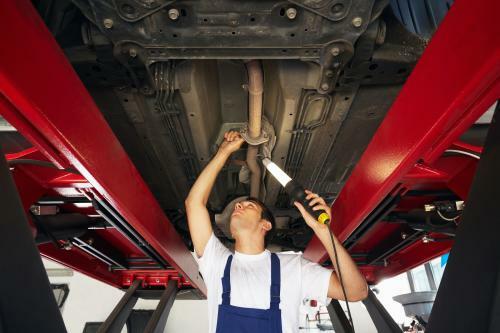 Then they'll go over normal wear-and-tear items, such as tires, brakes, shocks and struts, and so on. They'll even check the wear patterns on pedal pads and carpeting and compare that with the vehicle mileage, to make sure they indicate the mileage shown on the odometer is accurate. Finally, they'll work up an estimate for any repairs that are needed right away, and for any repairs you'll need to consider in the next few months. There might be a few things needed — that's not unusual or unexpected — but you'll drive off ready to make an informed decision about whether to buy this car or keep on looking. And who knows? The repair estimate may be just enough to convince the seller to knock a few bucks off the price! So, before you lay out your hard-earned cash for a used car, do yourself a favor: Call your nearby Cottman center and find out when you can bring it over for a thorough pre-purchase inspection. Disclaimer: Cottman’s Used Car Pre-Purchase Checkup is a service provided to our customers and is not intended to be used to determine the future performance of the vehicle and is not a warranty of any kind. Cottman centers are not responsible for any alleged consequential or resultant claims or damages concerning the subject vehicle.